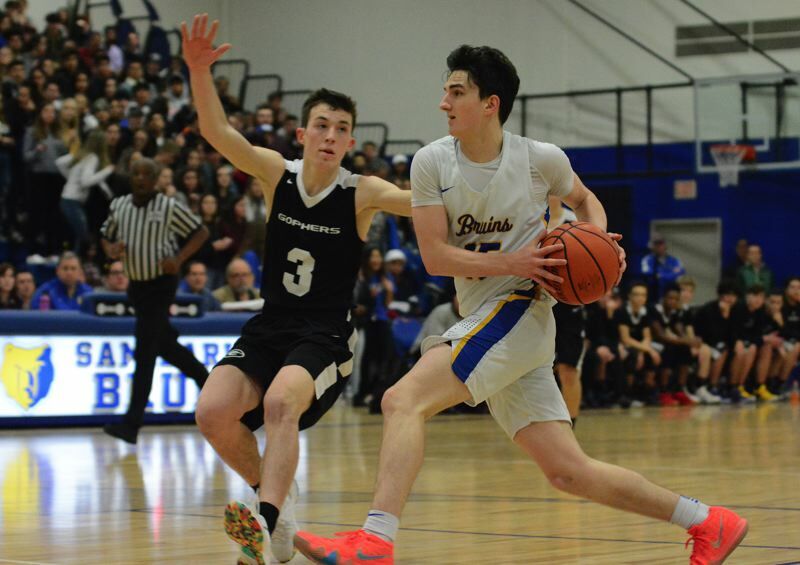 The Barlow boys basketball team was playing to a packed house on rivalry night, and the Bruins charged up the home crowd from the opening tip on their way to an 82-67 win over Gresham on Friday. 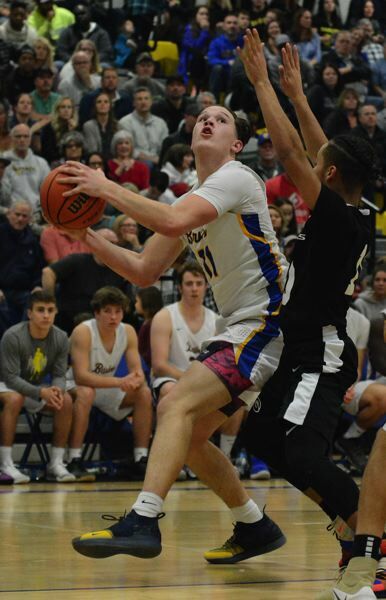 Dominic Jacoby knocked home a pair of early 3-pointers to go along with a pair of free throws, as Barlow put the game's first nine points on the scoreboard. "I was hungry and fired up to play our rivals," Jacoby said. The Bruins didn't slow down. Jaren Hunter pulled off his specialty on the defensive end and drew a charging foul, which not only resulted in a turnover but also a technical foul on the Gophers' bench. Jesse White sank the bonus free throw, hit a 15-footer from the left side and swished a 3 in front of the Barlow student sections that got the Superfans roaring. They had reason to get even louder when Evan Inglesby punched the ball loose and sent it ahead to Jacoby for another easy two. Moments later, Jacoby fired a deep pass down the floor to White for a breakaway layup. The game was emotionally charged from the get-go with the transfers of Daello Portin-Chapman (to Gresham) and Charles Ndayizeye (to Barlow) over the off-season. Any time either would touch the ball, the opposing student section would blast them with noise. Ndayizeye got his first taste of the boo-birds shortly after coming into the game in the second quarter and responded by sinking a 3-pointer, only his second of the season, from in front of the Gophers' bench. Barlow was in charge 29-8. Gresham made a run before halftime with Eric Puclik putting a high floater off the glass followed by a trey from the left side. Ethan Abrahamson added a putback bucket that trimmed the deficit to 10 points and sparked chants of 'Defense' from his teammates on the Gophers' bench. Puclik connected on a give-and-go with Portin-Chapman that ended with Puclik finding space in the corner for a 3 that brought Gresham within seven — the closest it would manage. Inglesby dribbled down the clock before driving the right side and going airborne past the baseline. But before landing into the gym's end wall, he released a pass to White for a buzzer-beating 3 that sent Barlow to the locker room up 37-24. Inglesby was on the receiving end of an alley-oop layup to start the second half and would follow with a steal and a breakaway dunk. Moments later, White poked a steal loose and fired a deep ball ahead to Noah Lowery for a layup and a 45-26 lead. 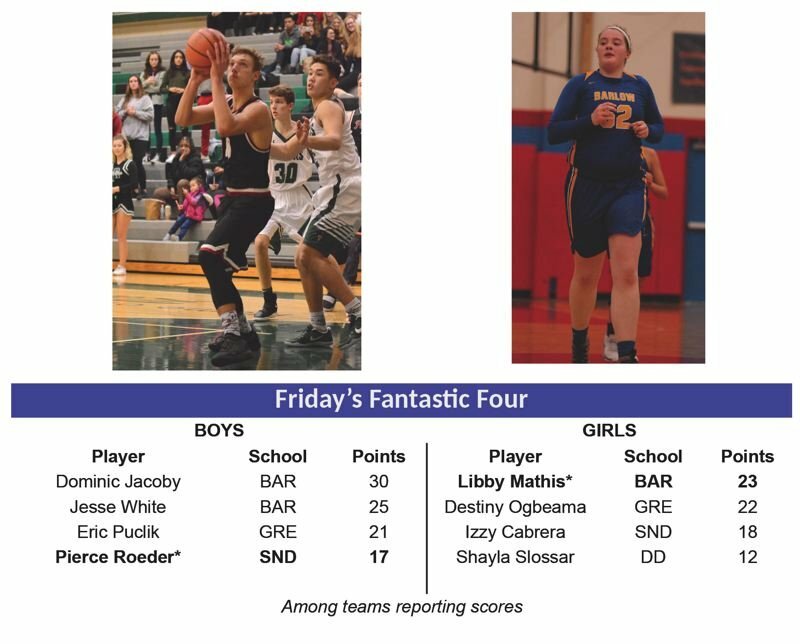 Gresham (67) — Eric Puclik 21, Abrahamson 14, Igbonagwam 10, Portin-Chapman 7, Larsen 5, Clinton 4, Lively 2, Sagiao 2, Butler 2, Herrejon, Mardini, Welch, Henkle. Barlow (82) — Dominic Jacoby 30, White 25, Inglesby 18, Wolcott 5, Ndayizeye 3, Hunter 1, Lowery, Weber, Thames, Vedus, Nomie, Jones, Koenig. This story is slated for our Tuesday, Jan. 15, print edition. 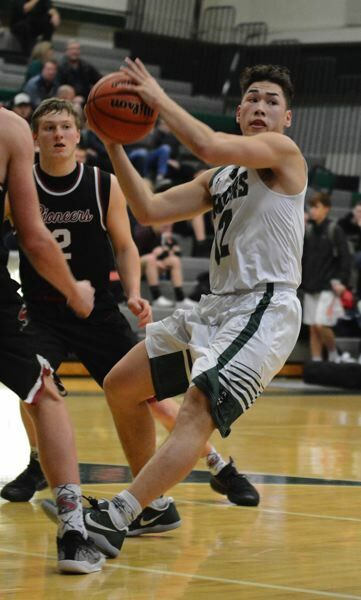 SANDY 74, REYNOLDS 53 — Pierce Roeder knocked down a 3-pointer from the top of the arc to give Sandy a 14-point lead only to see Reynolds play its best stretch of the game to whittle the margin to four after center Sterling Bell hit a corner 3 late in the third quarter. Colton Gorski took charge from there to put Sandy back in control. He started by scooping up a loose ball near the free-throw line and hitting a quick jumper. He started the fourth quarter by attacking the boards and putting a third-chance bucket over the front of the rim for what proved to be a three-point play. "We kinda let them back into the game for a moment, so we had to sharpen things up and finish like we know how," Gorski said. Sandy carried a double-digit margin throughout the fourth quarter. Reynolds caught a break before halftime when Sandy missed a free throw, and Cam Mager zipped down the sideline and beat the horn with a 3-pointer. Sandy (74) — Pierce Roeder 17, Gorski 16, Brewster 8, Murphy 7, Adovnick 6, Black 5, Carson 3, Johns 3, Hubbard 3, Classen 2, Powell 2, Chamberlain 2. Reynolds (53) — Sterling Bell 16, DeLeon 11, Coleman 9, Mager 8, Fletcher 4, Stewart 3, Taylor 2, Glenn, Ramos, Aguilar-Garcia. C. CATHOLIC 61, CLACKAMAS 44 — DeRay Seamster, Satavior Avilola and Isaiah Amato combined for nine buckets in the first quarter to carry the Rams to an early double-digit lead. Clackamas (44) — Jailen Hammer 10, Gavrilovich 9, Mahler 8, Aspidov 8, Erickson 3, Lewis 2, Dorn 2, Martinov 2, Babatunde, Vorobots. Central Catholic (61) — Darius Gakwasi 16, Seamster 12, Avilola 12, Amato 10, Ainslie 4, Gold 3, Parker 2, Johnson 2, Hallinan, King, James, Slater. D. DOUGLAS 74, CENTENNIAL 52 — The Scots put up 23 first-quarter points and carried a double-digit margin the rest of the way. Geo Baxter got David Douglas rolling with a pair of early 3-pointers on his way to a game-high 18 points. Jalen Calvert scored five buckets on his way to 12 points for the Eagles. Centennial (52) — Jalen Calvert 12, Barlow 10, Caro 8, Walters 7, Anderson 7, Johnson 6, Caron 2, Classer, Jlay, Taz, Estep. David Douglas (74) — Geo Baxter 18, Tuffa 10, Templeton 9, Robinson 9, Rodriguez 8, Barrow 6, Lohmeier 6, Muhammad 4, Hunt 3, Pedreza 2, Chavez, Frasquillo, M. Mohammed. 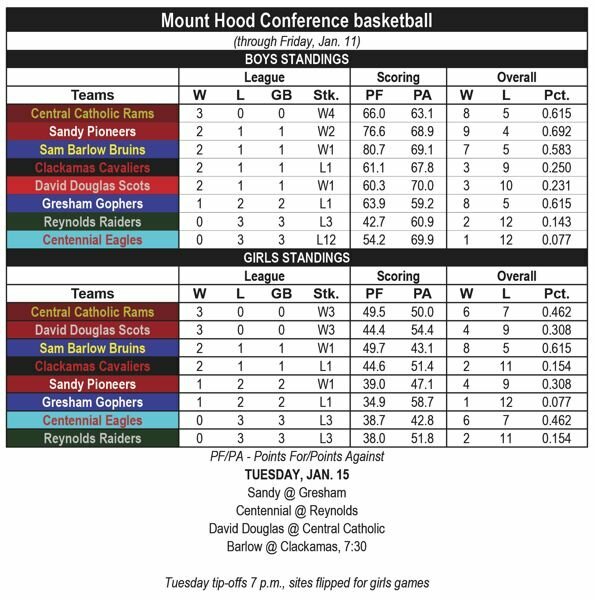 DAVID DOUGLAS 51, CENTENNIAL 33 — The Scots moved to 3-0 in the Mount Hood Conference after holding Centennial to a single bucket in the second quarter to open up a six-point halftime lead. Jenna Stradley knocked down a pair of second-half 3-pointers to help grow the margin. Centennial's Ellie Basinski knocked down four shots on her way to a team-high nine points before fouling out in the fourth quarter. Centennial (33) — Ellie Basinski 9, Kramer 6, McHone 5, Martine 4, Perry 3, Andrews 2, Green 2, Marcum 2, Vu, Miller, Maldanado. David Douglas (51) — Shayla Slossar 12, Collins 10, Fernandez 8, Stradley 8, Flowers 5, Ellarma 4, L. Collins 2, Bilibei 2, Luster, Wondwassen, Duku, Magada, Zhen. BARLOW 76, GRESHAM 42 — Monica Gifford and Maicee Bradley each knocked down a pair of 3-pointers in the first quarter to carry the Bruins to a 25-1 lead at the end of the first quarter. Center Libby Mathis filled the net 11 times on her way to a game-high 23 points, while sitting out the fourth quarter. Destiny Ogbeama led the Gophers with 22 points, including an impressive 8-for-9 (.888) showing from the free-throw line. Gresham (42) — Destiny Ogbeama 22, Arango 8, Williams 6, Mosley 4, Gould 2, Alngog, Jones, Goodwin, Walker, Baisden, Chavez. Barlow (76) — Libby Mathis 23, Miller 11, Rispler 10, Hiu 9, Gifford 8, Bradley 6, White 2, Waddell 2, Richardson 2, Charpentier 2, Barden, Matthews. SANDY 47, REYNOLDS 28 — The Pioneers opened up to a 24-8 lead after Tana Dwyre connected on a 3-pointer from the top of the arc. 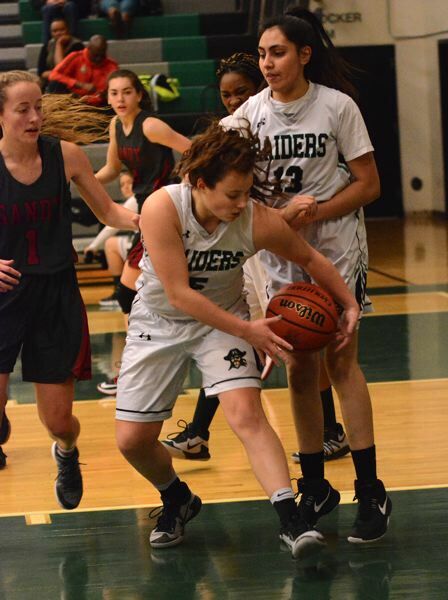 The Raiders tried to get back within reach with Kayley King pulled down a rebound with 0:08 left in the first half. She started the other direction and found Christina Chernoff along the sideline, who beat the horn with a 3-pointer to make it 28-15 Sandy at the half. Sandy put the game away shortly after coming out of the locker room when Bella Kansala swiped a steal and turned it into a three-point play. Izzy Cabrera swished a pair of treys and Sandy had the scoreboard doubled up 42-21 with 4:30 to play. Sandy (47) — Izzy Cabrera 18, Kansala 8, Thomas 7, McNutt 6, Dwyre 5, Maul 3, Eslinger, Turin, Adam, Dukart, McCrea, Dobson. Reynolds (28) — Christina Chernoff 11, Avalos 9, Jones 4, Andresen 2, King 2, Dominguez, Curtis, Tang, Badoni, Hughes.